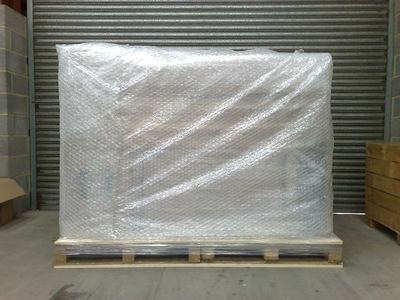 At 1st Move International we ensure that all your goods are thoroughly prepared for shipping by loading all packed items together onto Forestry Commission approved pallets, packing them carefully using our unique packing method, heat treating, tagging and stamping to comply with all overseas import regulations. 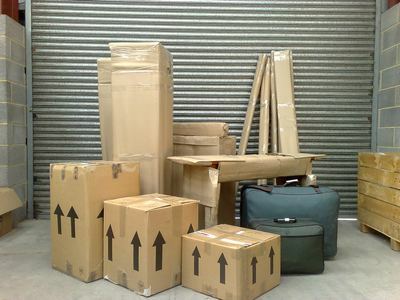 We are the only removals company who employ this system of packing. Our packing systems have been rigorously vetted, audited and approved by our insurance company and provide, without a doubt, the safest way to transport household goods and personal effects overseas. Our insurers love us and our packing methods ensure we have the lowest insurance claims records of any international removals company in the UK. Intelligent Shipping for a Faster, Safer, Smarter move from 1st Move International. Firstly, we pack individual items into cartons, crates or boxes. Furniture and larger items are paper and bubble wrapped for extra protection. To reduce shipping costs, we utilise all empty spaces where possible - inside drawers, between the legs of chairs and by packing soft furnishings such as bedding inside white goods. Space costs money! Our packers are experts at filling up those empty spaces to ensure maximum cost savings for your move. This process makes for a fantastic, tight, safe and secure package so your household goods are not rattling around inside a shipping container on their journey overseas. Simply a great way to ship your stuff. 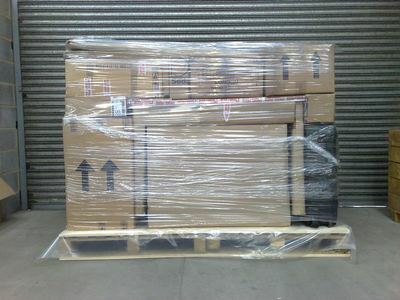 Once packed and arranged tightly onto your pallet, your shipment is then wrapped with a clear stretch-wrap film to bind all items tightly together to minimise movement in transit. A further layer of double walled cardboard sheet, and 2 layers of export standard bubble wrap are added to help protect your goods from accidental knocks or bumps – and that’s just the start! Now for the good bit. We use a 125-micron polymer plastic film (shrink-wrap) to encase your shipment. This heavy-duty plastic bag is designed to shrink to a tight fit when heat treated. Strong, durable, weather and waterproof. It comes off our rollers like a large open ended bag. 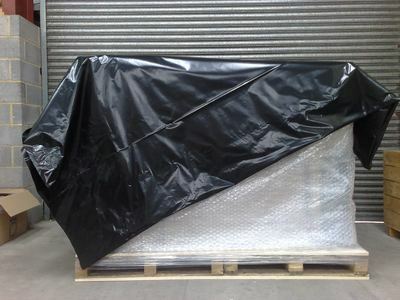 We seal one end of this bag and cover your pallet to form a safe, secure, strong and weatherproof shroud. This is then carefully heat treated to shrink fast and bind the whole pallet tightly together. Magnificent! We’re not finished yet. Polypropylene strapping is then used to further secure the pallet. 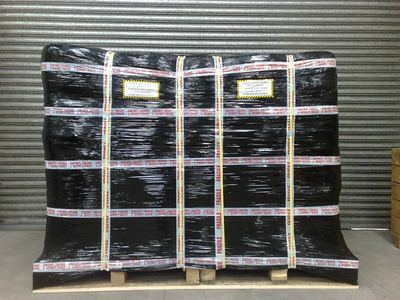 With a breaking strain of 160kg, this tough export strapping is fed under the wooden pallet and over the top of your shipment (four times on a smaller pallet - six times on larger pallets). These straps are then joined and sealed together with a metal seal. The crimped seal closure provides a tight grip on the strapping for extra security in transit. Now there is no side to side movement whilst your goods are inside our shipping container. What a great idea! Your pallet is then labelled and security sealed with a unique 1st Move ID Number. The security seal shown is B101065. Each seal has a different tracking code unique to your shipment. This number is recorded on all shipping documentation and provides a detailed paper trail in the unlikely event that the pallets have been tampered with. That doesn’t happen on our watch! The seal is a visual reminder to others that we can track the security of your pallet throughout transit. From our UK warehouse right up to your front door, your goods are being logged and checked every step of the way. Nobody messes with a 1st Move Pallet! Finally, we precisely measure your pallet. Length, width and height are measured exactly to the nearest centimetre. This gives us your chargeable volume and our world-famous price guarantee, so that you know you’ll be charged for the EXACT size of your house move. No nasty surprises when you get your final bill. These measurements are clearly recorded on your pallets and are subject to additional checks by the shipping line and port authorities. You can also check the sizes when the goods arrive at your front door. We photograph every pallet and post it to our Facebook page so you can see the finished, expertly packed shipment before it sets sail overseas. For larger moves that require full containers we pack a little differently. To see for yourself how we do it, check out the loading video on our container shipping page. We are the only international removals company in the UK who use this revolutionary shipping method for the transportation of personal effects and household goods, and once we have packed your shipment we post a picture of every move to our Facebook page. Neat!